Soccer enthusiasts gathered at Lake Eola on Oct. 20 for a special announcement from Orlando City Soccer Club (OCSC) unveiling a new National Women’s Soccer League (NWSL) franchise, which is set to launch in 2016. Named Orlando Pride, the launch of the women’s team comes on the heels of the overwhelming success of Orlando City Soccer Club’s opening season. The Orlando Pride is the 10th franchise to join the NWSL, which features national team players from Canada, Mexico and the U.S. and will enter its fourth season in 2016. OCSC Founder and President Phil Rawlins had been in talks about a women’s professional soccer team in Orlando for more than a year and was thrilled to officially announce the team’s arrival. 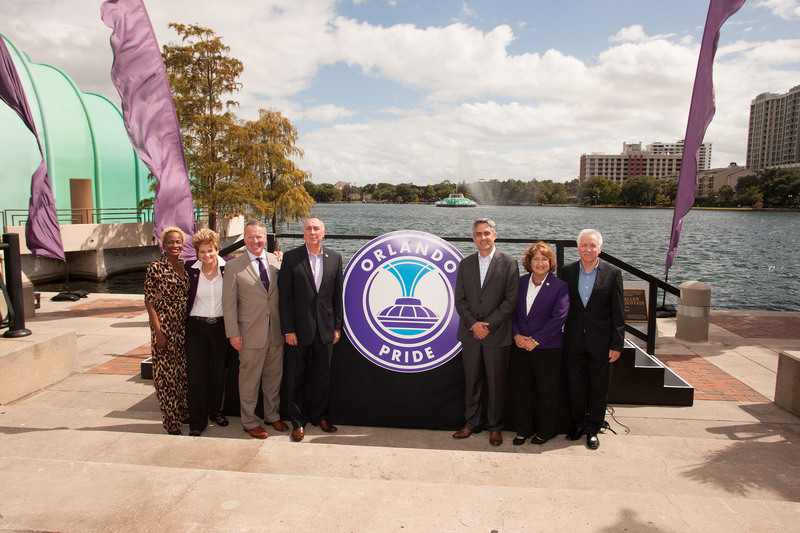 Rawlins unveiled the team’s logo, which prominently features downtown Orlando’s Lake Eola fountain with the colors purple, representing Orlando City Soccer and blue, representing the water geyser at Lake Eola as well as the lakes known to Central Florida. “The name ‘Orlando Pride’ captures how we all feel about the City of Orlando, as well as firmly tying into the OCSC Lions family,” Rawlins said. The Orlando Pride’s head coach, who is no stranger to women’s professional soccer, was also announced at the event. Tom Sermanni comes to Orlando with an impressive record having served as the coach of both the Australian and U.S. women’s national teams in the past. As head coach, Sermanni will leverage his expertise to help build one of the best women’s soccer teams in the world. To view more photos from the Orlando Pride press conference, visit Mayor Jacobs’ Flickr album here.